It doesn’t matter what storage variant of iOS device you’re using, storage management is always a concern, as sooner or later, running out of storage space is almost inevitable. And when that happens, you usually have to restrict yourself from performing storage intensive activities, such as shooting high quality videos, downloading media from Internet, and so on. The situation is worse when iOS prompts you with a major system update, as they are quite big in size, and require sufficient free space in order to install them. In this article, we’ll explore some effective solutions to free up as much storage space as possible, on your iPhone, iPad or iPod Touch. If you’ve been using your iPhone, iPad or iPod Touch over a long period of time, you might have apps or files stored on your device that you no longer need. You can consider removing them in order to free up a significant amount of storage in the following ways. The Camera Roll stores all the photos and videos shot with the iPhone or iPad camera. You might want to remove a lot of these files from your device in order to reclaim free space. The two apps mentioned below, can make it easier to locate and delete unwanted photos and videos from Camera Roll. Photo Cleaner is an app that can sort your Camera Roll items according to size, so you can find out which file is taking up more space. You can then select the ones that you no longer need, and delete them from your device. Additionally, the app can also help you locate duplicate photos and videos in Camera Roll, so that you can delete unwanted duplicates. Sometimes, you might save catchy photos and videos on your iPhone, iPad or iPod Touch that are good for sharing with friends, but not worthy enough to keep them after a while. Magic Cleaner is an intuitive app that helps you locate and delete such type of files from Camera Roll. You can find more information on Magic Cleaner in this article. Your iOS device may contain apps that occupy a lot of storage space. 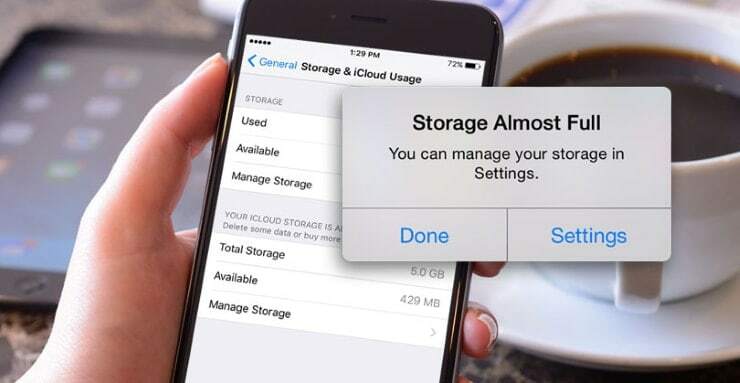 You can easily find out how much storage each of your apps consume by going into Settings >> General >> Storage & iCloud Usage and selecting Manage Storage under Storage section. If you find apps occupying considerable storage space on your device, but don’t use them frequently, you may consider deleting them by selecting the apps individually, and tapping on the Delete App button. Attachments: Such type of app data can generally be found in messaging apps like WhatsApp, where media files may be shared within conversations. Such files usually remain within the device storage unless they are manually deleted. Moreover, on WhatsApp, if you have turned on the option to save media files to Camera Roll, you might have two copies of media files stored on your iOS device — one in WhatsApp’s in-app storage and another in Camera Roll. Magic Cleaner can be useful for removing unnecessary media files in Camera Roll coming from WhatsApp. If you want to remove media files from the in-app storage, you need to launch WhatsApp, select the particular conversation from which you want to delete media, tap on the Group or Contact’s name on the top of the screen, and select Media, Links and Docs. Finally, you can select and delete the particular files that you want to remove. 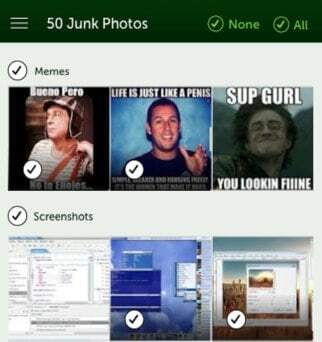 We have given the example of WhatsApp here, but attachments can also be removed from other such apps in similar ways. Stored files: Some apps allow users to store data within themselves, such as file manager apps. You can browse such apps manually and selectively delete files that you don’t need. For native apps like Music or Videos, you can directly delete media files available in their individual storage containers, by going to Settings >> General >> Storage & iCloud Usage and selecting Manage Storage under Storage section, and tapping on Music or Videos from the app list. Here, you can directly see the list of files available within the particular app, and selectively delete them. App Cache: Some apps may use the in-app storage for caching purposes. Storing Cache helps apps to fetch data locally from the device and hence reduce loading times. Few of these apps allow users to clear the cached data from the Settings menu. Others, like Facebook, don’t provide any such option. In such cases, there are few solutions for deleting app cache and other junk externally using certain third party apps. After going through the above steps, if you have some important photos, videos or files stored on your iOS device, that you don’t access frequently, you can back them up to your computer or cloud drive, and then delete them from the device. You can free up considerable space on your iOS device even without deleting your data. If you shoot a lot of photos on your iOS device and edit them with the native Photos app, you might have noticed that you can easily revert your changes at any time. This is because iOS stores a copy of the edited image over the original. So each time a particular photo is edited, its size increases. You may be able to drastically reduce the size of your photos with the help of certain mobile as well as desktop apps. Such apps may use both lossy and lossless compression techniques to reduce file size. In lossy compression, the quality of the image is affected. Lossless compression, on the other hand, does not affect image quality. PhoneClean is a desktop client which helps you clean up your iOS device by deleting junk files. Among others, the app lets you clear Photo Cache, which includes Filter Photos, Photos in Trash, album artwork cache, camera photo cache, etc. The Filter Photo section of PhoneClean lets you delete edited copies of an image and only keep one version. This can help free up considerable space on your iOS device, if you edit a lot of photos using Photos app. If you want to compress photos directly on your iOS device, there are some apps available in the App Store, which may be helpful. 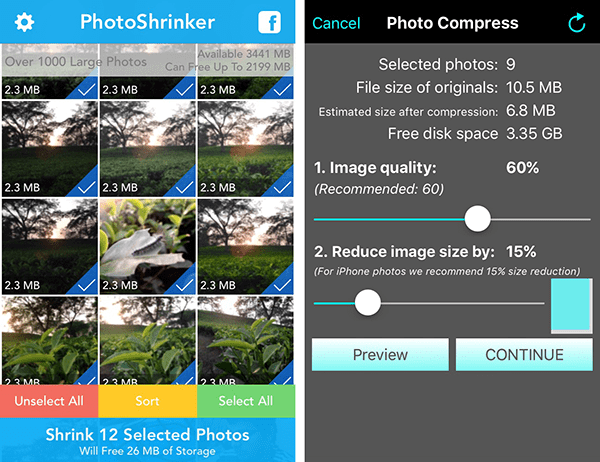 PhotoShrinker is an iOS app that intelligently compresses photos to save space, in such a way that the image quality still looks the same as the original. The nearly-lossless photo compression technique can shrink photo size up to one-tenth of the original photos. Photo Compress is another app which helps you free up space on your device by reducing the quality and/or the size (dimensions) of images in your Photo Library. When you select a particular photo for compression, the app offers two separate sliders for controlling the quality and size (dimensions) of the image. Finally, you can tap on the Continue button to save the changes. Note: Both PhotoShrinker and Photo Compress will prompt you to delete the original photo from Camera Roll after processing them. This, however, does not immediately remove the files from your iOS device. Deleted photos are moved to the Recently Deleted folder in Photos app, from where you have to manually remove them. Otherwise, deleted items are automatically discarded if they remain there for 30 days. Similar to photos, you can also compress videos in order to free up space on your iOS device. Video compression can be both lossy as well as lossless, and we have a dedicated article for lossy and lossless video compression on iOS as well as on other smartphone platforms. You can learn more about it here. After having removed all the unwanted apps, data and media files, there is still one more category of unwanted files left to be deleted, which can occupy significant amount of storage space. These files (referred to as junk) are not readily accessible from the device, but may be deleted using certain third party desktop clients, such as PhoneClean. You can learn more about various iOS junk removal techniques in this article. The above methods will help you reclaim much of the used space on your iPhone, iPad or iPod Touch. If you know of any other solutions for freeing up space on iOS devices, do let us know in the comments below.